After driving potential customers to your website through PPC ads, organic search results, or a targeted campaign to create online traffic, the most logical way to turn those visitors into leads is by getting them to register via an online form. For this blog post, let’s assume you’ve already presented an offer with a strong enough value proposition to get your visitor to actually be interested in filling out your registration form. Let’s just focus on optimizing the form itself. A form can have any number of fields, of course, and it would seem if you have more required fields on the form, you will generate more lead information for the database. Can we all agree to that point? Great, let’s take a look at a recent lead generation test then. Marketo, the marketing automation company, has a content-fueled top-of-the-funnel marketing strategy that drives traffic to its website in order to access that content. Some of the content is ungated, but what the company calls “middle stage” content (buyer’s guides, ROI calculator, RFP template, independent analyst research, etc.) and some of its “late stage” content (such as a comprehensive product demo) all require registration. Because Marketo requires what it considers high-quality website visitors to register so it can track their behavior and contact those visitors, it conducted A/B testing on its forms to find the best-performing version. The company tested forms with five, seven and nine field forms. All five fields are required. The seven-field form added “# Employees” and “Industry,” both with dropdown menus. 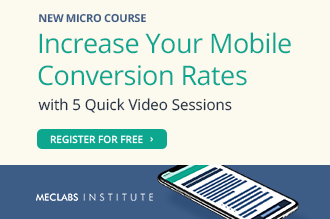 The short form with only five fields — first and last name, work email, job function and company — produced an average conversion of 13.4 percent, with a cost-per-lead of $31.24. Adding additional company information fields — number of employees and industry — to the form dropped conversion to 12 percent and raised the cost-per-lead to $34.94. Adding CRM system and work phone fields further lowered conversion to 10% and cost-per-lead jumped to $41.90. Clearly, shorter forms are more effective in getting Web visitors to actually complete the registration and in terms of lowering the cost-per-lead. The trade-off is that with a shorter form is you are collecting less information for your database. Jon Miller, VP Marketing, Marketo, doesn’t see using the more effective shorter forms as a problem. “People lie on the forms all the time,” he says. MarketingSherpa research backs up Jon’s sentiment, showing the accuracy rate of self-submitted data. Jon’s solution is to use the basic information collected on the short form and buy the data to fill out the database record on the new lead. He explains, for Marketo it is actually less expensive to use a short registration form with a higher conversion and lower cost-per-lead to capture basic lead information that can then be used in conjunction with an outside vendor to complete the record, than it is to ask for more information on the registration form. Information that might not be correct, anyway. Marketing Strategies: Is performance-based vendor pricing the best value? 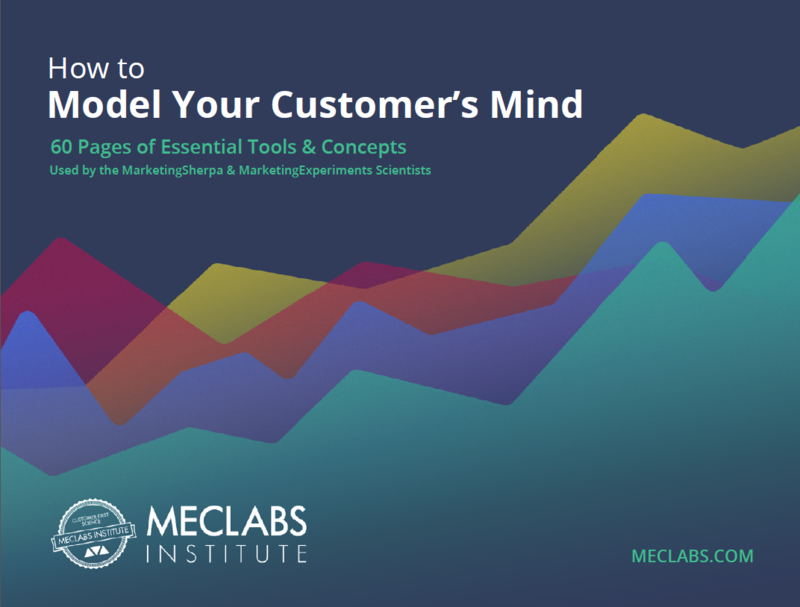 Fascinating case study – kudos to both MarketingExperiments and Marketo for sharing the data. The one question I wish were answered more definitively is: does asking for a phone number decrease conversion rates? Here, business phone only appears on the 9-question form – it appears to decrease conversion rates but technically that could be due to the CRM question. From my experience, most sales execs will demand that “phone number” is a required field on reg forms – it would be nice to know whether doing so decreases conversion rates (as I suspect it does) and if so, by how much. Very interesting study, this also supports the results that we are seeing with our Real Time Identification service which identifies a set of firmographic attributes in Real Time as a visitor hits a website. This data then supplements a shorter form submission immediately with higher quality, and more complete data about the Company. It also has other benefits such as driving dynamic content to improve website engagement, and others. Yes I have always had this experience with my lead gen sites. More fields usually = more obstacles = less leads. We usually ask whether they would mind answering further questions once they have hit submit (using ajax so they don’t feel like they are leaving the page) or once they have hit the verify link in the auto responder. Thanks for all the comments, everyone. Howard, I don’t have information on how the phone number alone affected this test. As you mentioned, it was tied to “CRM system” and I don’t believe it was tested alone. Jon’s main point is he is much more willing, and has found it less expensive, to ask for minimal information that can then be used to tap into a cloud database and purchase the complete set of fields on that lead. I would even suggest that you combine first and last name into simply Name, and that you drop the job function field. It would be interesting to see the results of a 3 field form with just name, company and email. In fact on one of our sites, we ask for just name, phone and email, and often time we know the company name because that is where their email is at, or we can reverse lookup the phone. The Less is More perspective works well when your media is targeted, but you don’t have a tightly defined prospect definition. Introduce filtering using 3 – 4 questions and undoubtedly, response will decline. But so will wasted time on the part of Sales. The sales team will focus on fewer prospects representing higher potential ROI. That focus on highest value prospects must be part of the equation. Great post, thanks for sharing – not sure of the math works – how does shorter form length reduce cost-per-led? Also, I would expect that buying the data to complete the lead needs to be part of the equation? Kirk — Jon said Marketo used an average cost-per-click based on conversion rate to determine the cost-per-lead. 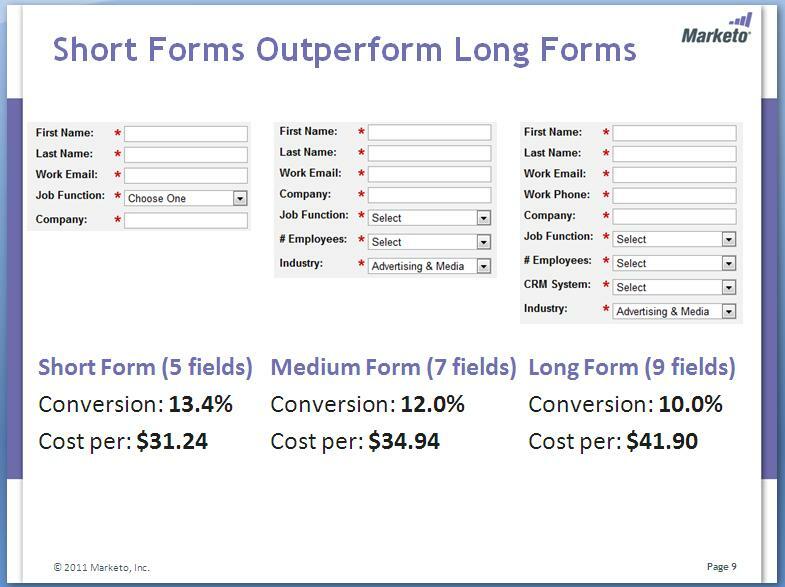 I’m not certain if purchasing the full data field on the new lead is included in the cost-per-lead figures Marketo provided, but Jon did emphasize it was less expensive to use the short form and buy the data than using the longer form with a significantly higher cost-per-lead. Thanks for the article David. I have been ranting on to my clients the exact same thing for years. 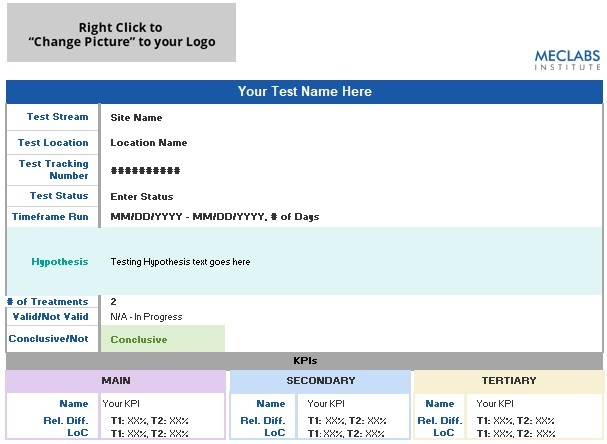 We did similar test to find the sign ups to be 80% higher between a 10 field form and a 4 field form. Great article on a topic that is neglected. The number of form fields is important however if your marketing and UVP are strong enough (i.e., you’ve done a good job of bringing in qualified prospects and motivated them on your site, then you can get away with more form fields. I think companies are too passive and conservative about the form itself. As long as the form field is relevant, people won’t mind an extra field and that extra info might be vital to the salesperson in preparing for contact with the prospect. This is an interesting article. I have a question though. 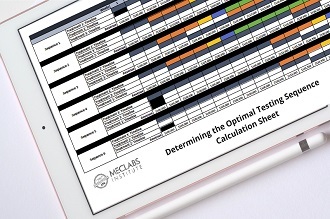 Did you test this on a landing page or did you test it on an inner webpage? I found that forms on a landing page are not a good idea. I like to ask for email only on a landingpage and then create my leads via email marketing. Thanks for the question, and Marketo actually conducted this test entirely in-house and just provided their results to us, so I’m not absolutely certain on the answer. From my interview with Jon I understood this particular test to be conducted on squeeze pages presented to website visitors downloading Marketo content that the company considers high-enough value from the web visitor behavior standpoint to turn that visitor into an actual lead. So basically, the tested forms were presented to web visitors based on actions they were taking at Marketo’s website. This is an interesting article. I have a question though. Did you test this on a landing page or did you test it on an inner webpage? Thanks for all the comments, everyone. Howard, Shoutify Me As you mentioned, it was tied to “CRM system” and I don’t believe it was tested alone.